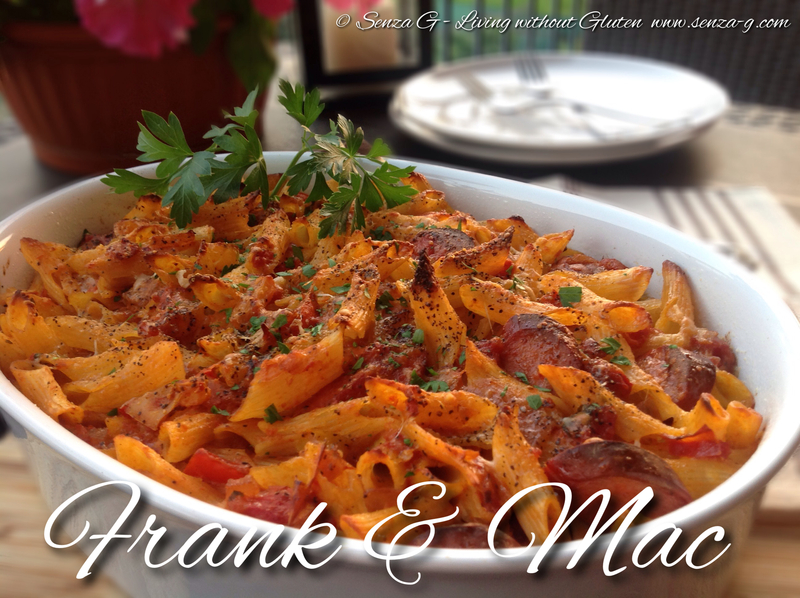 A cousin of the famous Mac & Cheese, Frank & Mac is the tomato version, made with frankfurters, tomatoes and capsicum. Loved by adults and children alike! Preheat oven to 180˚C. Start by sauteing the onions and garlic in olive oil until softened, add the sausage slices and the chopped red capsicum. Add also the spices and herbs and the tomato puree and cook until fragrant. Pour in the red wine, add the crushed tomatoes and the stock, as well as the bay leaves, mix well and bring to boil. Lower the heat and leave to simmer for at least 30 minutes, adding more stock if it thickens too much. Beat the eggs in a bowl and add the Parmesan cheese and chopped parsley to it. Set aside. In the meantime, boil the pasta but leave very al dente as gluten free pasta breaks easily. Drain the pasta and add it to the sauce, together with the beaten eggs. Season with salt and pepper and combine gently. Grease a baking dish and pour in the pasta. Dot with butter, sprinkle with a bit more grated Parmesan and a good grinding of black pepper. Bake for about 30 to 40 minutes until the top starts browning and looks crunchy. Remove from the oven, let it rest for a few minutes before serving.